Once again a great event attracting entrants form New Zealand, NSW South Australia and local Victorians. The hard work by committee and club members prior and during the event made it enjoyable for all. Sedans had 8 entries for the event. Much easier for the lead drivers to navigate compared to the fleet of 13 in the Mini final. The weekend had two debutantes Cooper Harris and David Verricchio. Interesting to watch driver styles, one trying to stay connected to the bitumen and the other on occasions not have any contact with the bitumen. 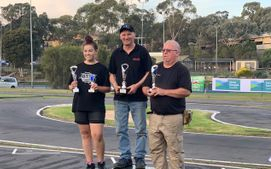 Andy Bishop once again took out TQ and led the final from start to Finish. Many thanks needs to go out to our interest state Visitors. From South Australia we had Matt Harris and from NSW Brad Smith and Craig Hawkins. Brad and Craig put in aggressive attempts to try and reel in Andy. The home ground advantage, great car setup and master driving of Andy resulted in a new final record of 88 laps. The Mini class had a massive contingency of South Aussies who traveled across with the plan to upset the local task force. The final was going to be big with the decision to run 13 Minis instead of 12. To everyone’s amazement the first lap went without incident. The line of Mins was like one big ANGRY freight train that was not going to stop for anything. This was definitely the mentally for the lead 6 or 7 cars l think were still on the lead lap half way through the race. David M from second on grid to an early lead and was battling a bombardment from Gary Logan until the two drivers had a coming together letting Jack pounce from third place and grabbing the lead. From there on there was no catching Jack. A special mentioned needs to go out to the other drivers, Tyler, Charlotte, Greg, Warren and Megan who not only had to driver the racing line but then had to manage driving wide in the dust and marbles letting the crazy leaders coming storming through. This is one raced l loved being in but would have also loved to watch. Joel Miller -taking out the junior trophy, finishing third overall and one lap down on the winner. Big effort. Nice try but l made sure the VIC quad were ready for you. Well done and love your passion. Ryan Withers had a mixed weekend. Normally up-front battling for the lead unfortunately this weekend was short about 0.2 to 0.3 of a second per lap. Ryan did however achieve two milestones this weekend 10 out of for acrobatics and finishing a State Final. First, achievement racing his Mini full throttle down the back straight, hitting and performer a somersault over another mini that had crashed and wrongly crossed the back track. Amazingly his X-Box min was still able to drive off and run. And second achievement finish his first state event also only 1 lap down from the winner completing 81 laps. A special congratulation and thanks needs to go to the Withers family who have traveled as a family support Ryan and attending about 7 state championship., NSW’s, South Australia twice and Melbourne. Each time electrical problems, or incidents on the track has end their campaign early. Most would give up but not Karl and Ryan. Last mention for the weekend needs to be Jason Cavanagh. Another great ambassador for the sport. What a roller coaster ride of good luck and bad luck. Mate, after you got rid of the boat anchor and was on pace l enjoyed Friday’s practice session racing for sheep stations. Close racing almost trading paint was awesome. Thanks to all and look forward to the next time we catch up and battle for Mini supremacy. Oh and well done Jack. GRRRRRRR! Friday practice and the sun was shining, and the tarmac soaking the heat in nicely. All bikes were having a blast, while the track was still very green there didn’t seem to be a shortage of traction on the black stuff with a few surprise wheelies and back flips making a great spectacle. Saturday morning for the first round of qualifying Mother Nature decided on very cool and overcast conditions with small shower thrown in the mix during the drivers briefing and again during round 1 of the bikes. This made things interesting to say the least, all bikes struggled as the spots of water filled the track before stopping at the end of the round. After 4 rounds of qualifying it was Andy Bishop looking set to TQ. Davide Varricchio in 2nd and Ben Skerry sitting safely in 3rd. With just 2 rounds left of qualifying it seemed like Andy was set to continue his clean sweep of TQ’s at all major events. Sunday morning and once again the Sun was shining, a perfect race day ahead. 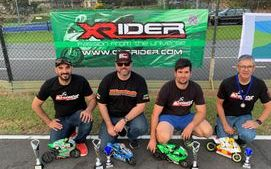 We kicked off with Q5 and after finding some small issues on Saturday night and maybe even a little form, Davide Varricchio brought some speed and consistency with him, while Andy suffered from a bad choice of tyre but still battled hard. Ben Skerry posted himself a PB for the weekend and finished the run in second bumping Andy down to 3rd. Q6. 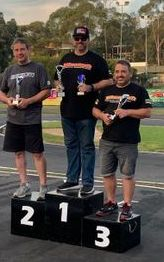 Was a tight battle with the race win forecast swapping from Andy to Dave lap after lap all the way to the end of the heat, Dave took the Win but Andy had secured his TQ. Finals time, the bikes were prepped again, new boots fitted and we were off racing. F1 was pretty UN eventful finishing as it started with Andy in 1st, Dave 2nd and Ben 3rd. F2 was one of the best battles the club and guys running have ever experienced. It was on from the first corner with Dave showing Andy a wheel and thought about stuffing it up the inside of the hairpin on lap one. Ben was tucked in nicely in 3rd and as they made their way down the back straight for the first lap barely a bike length separating the 3 of them. The battle for the lead changed no less than 8 times in a 10 minute heat. For the first 7 laps it was a group of 3. Ben was ready to pick up the pieces of Andy and Dave coming together. Eventually making a small mistake Ben settled into 3rd but only a corner or 2 behind the lead group of 2. Andy and Dave battled it out all the way to the last lap. Dave took the win for F2 by just 4 seconds. They were 1 a piece making for an interesting 3rd final. F3 and everyone was hoping for a repeat of F2. It was a close race but a couple of mistakes from both Ben and Dave gave Andy the breathing space he needed to bring home the overall Win. Congratulations to him and the rest of Bikers who put on an awesome show. 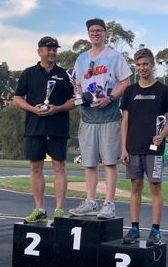 Special mentions to Peter Chang for making the trip from NZ to join us, thanks Peter and well done on winning Concourse and setting some PB’s for himself over the weekend and not coming last. Another mention has to go to George Tsakanias for cracking the 25 second bracket with his bike after virtually no practice, Good Job George! Looking forward to the next round of Large Scale Championship. QLD. Truck Washup- This is a sensational support class once again supported and backed by Warren Meissner. A field of about 7 drivers entered the event. These tracks make even the biggest track look crowded and racing usually results in some serious body to body contact. Heats were dominated by Jason Cavanagh who took out TQ for the final. There is no love lost among this group, from the very start Jason on pole an Warren who was second on grid came together fighting for the glory of leading the pack through turn one. This ended up ending Jason’s truck campaign damaging the drive train.